Investors have two main options when it comes to storing their gold. They can either store it at home in a safe or suitable storage solution, or they can have it professionally stored on their behalf. There are many brokers that offer this as a service who will offer to store any gold you buy from them in an allocated vault, or you can also store it in a bank vault. The size of your portfolio will likely determine which option you go for but there are also other things to consider such as ease of access and the responsibility of keeping any gold you store at home safe and secured. The best method of storage is probably to use a combination of different storage methods, as by doing so you spread the risk of anything happening to your gold. Having a safe stored in your home is an ideal solution for people with a smaller number of gold holdings since you can access it at any time. The one downside to storing your gold at home, however, is that you are solely responsible for its security. This means that you will need to ensure any gold is insured, otherwise, you won’t be applicable for any kind of pay-out should anything happen to it. Your home insurance costs are also likely to go up if you have a large amount of gold stored at home. How should you actually do this? If you choose to store your gold in this manner, then you should make sure that your safe is bolted to the wall or floor for security reasons and that it is hidden in a secure non-obvious place. It is also wise to let someone you know, and trust have access to its location and passcodes as well, just in case you fall ill or are unable to access it yourself for whatever reason. in a sock draw or under the mattress, which is often the first-place thieves tend to look. If you’re storing your gold at home but don’t want to use a safe, then any hiding place you use should be subtle or clever enough that most people wouldn’t think to check there. Some people store their gold in everyday items such as fake cookie jars and hollowed out books. This is probably too obvious a hiding place as a lot of people have used these methods in the past. Another aspect to consider is that if you’re going to hide your gold under the floorboards you should also make sure you cover it with something like a cabinet or bookshelf. Paying to store your gold in a third-party vault, not only delivers confidence that your precious metal is secure, but these types of services are almost always guaranteed to be insured. The benefits of storing your gold in a vault are that it can save on insurance costs and you’ll have peace of mind that your gold is secure. You can access your gold at any time and you’ll be provided with a unique code to allow you to access your vault. Vaults are guarded 24 hours a day, 365 days a year, unlike your personal safe which can be left unattended daily, when you leave the house. Up until a few years ago, it was quite common to store your gold in a bank vault as it was a cheaper option for investors and guaranteed security. Banking hours and bank closures, however, have led consumers to distrust this method of storage, as it means they can’t access their gold whenever they need it. Very few banks offer gold storage services nowadays as the additional security needed is costly. Therefore, you would likely have to travel some distance to access your gold if it was stored in a bank. When purchasing gold through Physical Gold you have the choice of protected door to door delivery or high-security storage in one of our specialist vaults. Investing in gold isn’t risk-free so don’t leave yourself open to loss. Choose a solution that’s right for you and always choose a trusted provider. 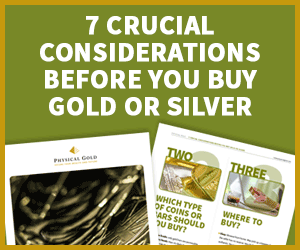 Call for expert advice on 020 7060 9992 or email info@physicalgold.com. This entry was posted in Blog and tagged Gold Storage, Physical Gold.